…his best encouragement must have been derived from his own sense of his artistic progress. This was advancing by enormous strides, the exact measure of which is furnished by the manuscript of the Sonata in F sharp minor now in the possession of Hofcapellmeister Albert Dietrich. It bears the signature ‘Kreisler jun.,’ a pseudonym adopted by Brahms out of love for the capellmeister Johannes Kreisler, hero of one of Hoffmann’s tales, and the date November, 1852. E.T.A. 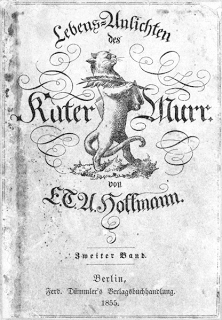 Hoffman wrote three novels about the musician and Kapellmeister Kreisler: Kreisleriana (1813), Johannes Kreisler, des Kapellmeisters Musikalische Leiden (1815), and The Life and Opinions of the Tomcat Murr together with a fragmentary Biography of Kapellmeister Johannes Kreisler on Random Sheets of Waste Paper (1822). Looking for more information I found that Schumann had actually written a piece he called Kreisleriana for piano, op. 16 (1838), and that Brahms had more than once used Johannes Kreisler as a pseudonym. It is also Schumann who really launched Brahms’ career, and rather fascinating that they shared a love for this fantastical figure in common. So after finishing the biography I read The Life and Opinions of the Tomcat Murr, with much enjoyment. I thought I might write about them in reverse order really, because the romantic vision of what a musician should be is so interesting, and plays such a role in the Brahms saw himself, as well as in the way he was received in a rather horribly snobbish society despite his origins. The stranger, a man about thirty years old, was dressed in black and in the height of fashion. There was nothing at all odd or unusual in his clothing, and yet his appearance did have something singular and eccentric about it. In spite of the cleanliness of his garments, a certain negligence was apparent, seeming to stem less from carelessness than from the fact that the stranger had been obliged to go along a path he had not expected to take, and for which his clothes were ill-suited. This was quite brilliant, and so recognizable from descriptions of Byron down to the romantic regency novels of Georgette Heyer passed from my grandmother to my mother to me. In Brahm’s own early life there is little of physical romance or love (or none, though in this kind of biography you can’t be sure) — though it is believed he was passionately in love with Clara Schumann, a brilliant pianist in her own right and wife to composer Robert Schumann. After Robert committed himself to a mental asylum, Brahms and the small circle of musicians around Schumann cared for Clara and the family (Clara had just delivered his eighth child! It was a different time…). Brahms actually moved into the same building and devoted several years of his life to them as Robert Schumann’s condition steadily degenerated. Von Sahr was the first person in Leipzig to make Brahms’ acquaintance, and, on the day after his arrival, insisted that he should leave his hotel to become his guest. 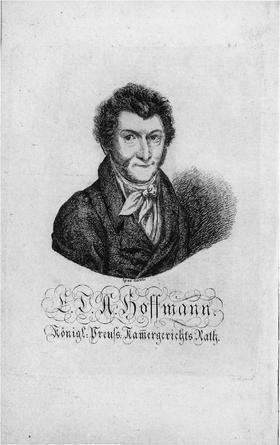 He introduced him to Mendelssohn’s old friend, the celebrated concertmeister, David; to Julius Rietz, conductor of the Gewandhaus concerts; to the personal acquaintance of Dr. Härtel; to Wieck and his daughter Marie (Frau Schumann’s father and sister); to Ernst Ferdinand Wenzel, one of Schumann’s special friends; to Julius Otto Grimm, a young musician whose room was on the same staircase as his own, and who soon became numbered amongst Johannes’ particular chums; and, generally speaking, to the entire Leipzig circle. ‘Yesterday Herr von Sahr brought me a young man who held in his hand a letter from Joachim. 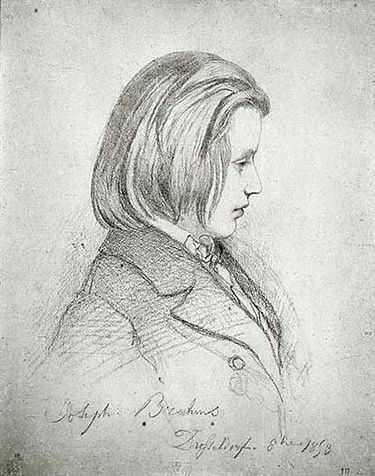 He sat down opposite me, this young hero of the day, this young messiah of Schumann’s, fair, delicate-looking, who, at twenty, has clearly-cut features free from all passion. Purity, innocence, naturalness, power, and depth—this indicates his being. One is so inclined to think him ridiculous and to judge him harshly on account of Schumann’s prophecy; but all is forgotten; one only loves and admires him. We listened now to the young Brahms from Hamburg, referred to the other day in Schumann’s article in your journal. The article had, as you know, awakened mistrust in numerous circles (perhaps in many cases only from fear). At all events it had created a very difficult situation for the young man, for its justification required the fulfilment of great demands; and when the slender, fair youth appeared, so deficient in presence, so shy, so modest, his voice still in transitional falsetto, few could have suspected the genius that had already created so rich a world in this young nature. Berlioz had, however, already discovered in his profile a striking likeness to Schiller, and conjectured his possession of a kindred virgin soul, and when the young genius unfolded his wings, when, with extraordinary facility, with inward and outward energy, he presented his scherzo, flashing, rushing, sparkling; when, afterwards, his andante swelled towards us in intimate, mournful tones, we all felt: Yes, here is a true genius, and Schumann was right; and when Berlioz, deeply moved, embraced the young man and pressed him to his heart, then, dear friend, I felt myself affected by such a sacred tremour of enthusiasm as I have seldom experienced…. If you should smile now and then whilst reading my letter, remember that it is the poet who has spoken, and that it was yourself who invited him to do so. The other aspect of Johannes Kreisler is his disrespect for rank and money. Hoffman’s book opens on a most hilarious scene that involves the painful humiliation of much of the small court because the Prince had requested an impossible spectacle for a party in the woods, and his courtiers were too afraid to betray the knowledge that everything was going wrong. It is appropriate for persons of high degree to be prey to strange notions; it increases respect. What might be called absurd in a man without rank or station is, in such persons, merely the pleasing whim of a mind out of the common run, and will rouse astonishment and admiration. May loves and respects Brahms, but does note that he was often unhappy and uncomfortable in high society, that people often found him rude, rarely understood his jokes and pranks and sense of humour. This reveals more than anything, I think, that not all the class barriers ever came tumbling down, despite his talent and the power of the time’s romantic idealism. Of course, I also love that he didn’t really care to fit into this society. What a fine time that was after the French Revolution, when marquises were making sealing-wax, and counts were netting lace nightcaps and claiming to be nothing but plain Monsieurs, and the great masquerade was such fun!